Mochi ice cream, it is also referred to as Nuomici or sweet rice dumpling in china. It is a confection made from mochi with an ice cream filling. There are many flavors to choose from, but the most popular are vanilla, green tea, chocolate, red bean, and strawberry. We can also make mochi ice cream at home. 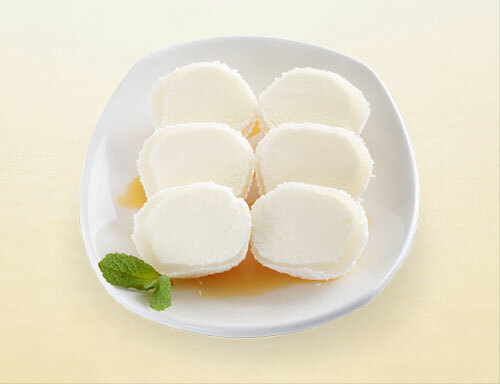 The best part of homemade mochi ice cream recipe, is that, you can put your favorite ice cream inside the mochi! 1. Keep your kitchen cool when you are working with ice cream. 2. Get a portioning scoop for creating the same portions and nice half-round shaped ice cream for mochi filling. Cover ice cream fillings with plastic wrap and freeze until very firm, at least 2 hours. 3. Stir rice flour, water, and salt together in a microwave-safe bowl, add sugar and stir until completely smooth. 4. Cover the rice flour mixture bowl with plastic wrap; microwave for 2 minutes. Stir rice flour mixture, re-cover the bowl with plastic wrap, and microwave until mochi dough is thick and sticky, about 1 1/2 minutes more. 5. Lightly dust the work surface with cornstarch. Turn mochi dough out on prepared work surface. Roll dough into a 1/8-inch thick rectangle; cut dough into 10 equal squares. 7. Repeat with remaining ice cream and dough squares. Working fast is the most important when dealing with ice cream. 8. Freeze until firm, about 2 hours.